Relationship between cumulative N supply rates measured using PRS™-probes during the first 30 days after planting and potato plant N uptake at time of top kill. Source: Dr. Derek Lynch, OACC, Truro, NS., and Dr. Bernie Zebarth, AAFC, Fredericton, NB. The PRS® Probe is an effective surrogate for bio-mimicking nutrient absorption by plant roots. All of the principal edaphic factors affecting nutrient supply to plant roots also affect nutrient supply to the PRS® Probe. 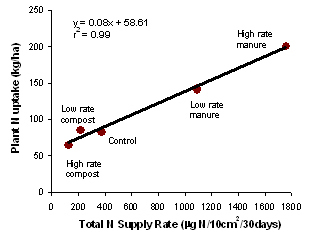 It is not surprising then that the PRS® Probe nutrient supply rates are highly correlated with plant nutrient uptake. Many studies have looked directly at the ability of the PRS® Probe to correlate directly with plant uptake by analyzing plant tissues for nutrient concentrations with great success (see examples here).